Daniel was a great front desk! He really made the stay much more pleasurable with his bright personality. We were in a accident involving 8+ vehicles that shut down I-94 one hour from Wisconsin dells on our way to Chicago. We were hospitalized due to injuries. We called around 8 am (day of reservation) to explain the situation. They refused to return even a portion of the cost of the hotel room. Seems like they could have had some understanding under these circumstances. Run down and too expensive for the amenities..hotel staff was nice. Heat was not always working. Rooms were dusty. Staff was wonderful! Great location! Room was perfect for my son and me to enjoy Wrigleyville and the lake front. Easy check-in! Nice option close to Wrigley Field! Nice lobby! The neighborhood is fantastic, walkable and pretty. But the room was small, old, smelly and dark. Great, planning to stay there again next year. The ball park is walking distance. beautiful neighborhood.No complaints. Great hotel to be near Cubs stadium and Lakeshore. I have no more to say about this but the site wants more so this. Lovely building with a great atmosphere and in a great location. Near the lake and Wrigley Field. Very friendly staff. Carried bags to room, went over parking details, all with a very welcoming smile and sense of hospitality. Great location. Walking distance to Wrigley Field and the Addison CTA stop. Easy, secure parking at the high rise around the corner. The room floor creaked quite a bit, making me feel for the people staying below me. If you are looking for something outside of the norm, this is the place for you. The rooms have a vintage charm and style! They are roomy and comfortable as well. The staff is the best in the business! The addition of the Cubs decor in a vintage style matched the building's character well. We will definitely visit again! We took a working vacation to visit our daughter who relocated to Chicago after college, and chose the Majestic Hotel mainly on the basis of its proximity to her apartment. Our room ( a suite with a king bed) was reasonably large and configured to permit one or both of us to work without inconveniencing the other. After we succeeded in locating, disabling and sealing up a plug-in air-freshener diffuser (does anyone really like that smell? ), the room was quite comfortable and pleasant for a 5-day stay. It was cleaned reliably and efficiently each day, and the staff were competent, helpful and willing to go the extra mile. I was particularly impressed with the desk clerk, who dealt with unusual difficulty in arranging a cab to the airport by bolting out the door and hailing a cab on Lakeshore Drive. He showed up with a waiting taxi in about three minutes. This hotel was located in a quiet, safe area. I was allowed to check in early for a $30 fee. My room was quite small with almost no view. The ceilings were high, and the lone small window in my room was above the midpoint of the wall and looked out into the courtyard, barely. I felt like I was in the basement, and I wasn't. The lobby area always seemed to be occupied by large groups of people, so I'd guess it was comfortable. The bathroom could have been cleaner as there were tiny holographic stars on the white tile floor presumably from the last guest. The shower appeared clean. This is a charming hotel, great location, neighborhood is very walkable. It's within walking distance of Wrigley Field, there are plenty of choices nearby for food and beverage. Close to the bus stops on Lake Shore Drive. Between public transportation, ride-share services, and walking, I didn't feel I needed to rent a car. The lobby was a great place to hang out and visit with family, and to get some work done during my stay. The Majestic is located in the heart of the Lakeview district of Chicago and a delightful place to stay. Breakfast was plentiful and the evening cookies were welcome. Truly a nice surprise! I had a horrible experience and would not book here and will be considering booking with another service other than Orbitz. I booked a room to celebrate our 25th Wedding Anniversary but the picture of the room was not the room I received. The room was a cave with one window filled with a clanky old clattering A/C unit. Picture reserving a room in a basement. It was dark and small. Orbitz customer service? HORRIBLE I called Orbitz and they said someone would get back with me. I got several robo-emails saying they could do nothing. I called again. Same response. The hotel made no concessions even though they admitted the room I booked was not what I received. I would not book this hotel again. This hotel is fairly close to Wrigley. We found places close to eat and transportation was easy to obtain. I loved being in a neighborhood with houses. A wonderful old architectural building with charm. Located in Lakeview within a short walk of Lincoln Park, The Majestic Hotel is within a mile (2 km) of other popular sights such as Wrigley Field. This 52-room, 3-star hotel has free breakfast along with conveniences like free in-room WiFi and a fitness center. Free continental breakfast is included with your stay and awaits you each morning from 7 AM to 10 AM. Order from room service to satisfy your hunger without leaving your room. A flat-screen TV comes with satellite channels, and guests can stay connected with free WiFi. The bathroom offers hair dryers, free toiletries, and bathrobes. Other standard amenities include a minibar, free newspapers, and a phone. Renovated in 2018, The Majestic Hotel offers a fitness center, free WiFi in public areas, and a meeting room. Front-desk staff can answer questions 24/7, and assist with luggage storage, securing valuables, and dry cleaning/laundry. 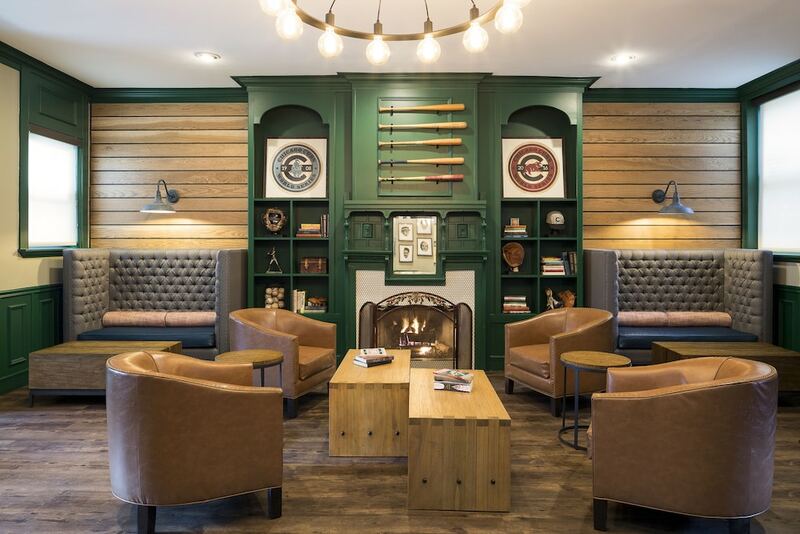 Other amenities at this boutique hotel include coffee/tea in a common area, free newspapers, and a fireplace in the lobby. Thank you for choosing our hotel for your Chicago stay! Dear Guest, Glad your stay with us was wonderful and Daniel was a great help to you! Hope to see you again! Dear Guest, We are very sorry for what happened to you. We were not aware of anything like this happening during that time to any of our guest. Dear Oz, Thank you for staying with us and for your feedback. We apologize for not meeting your expectations this time. Our heat is always on , but it goes on and off based on sensors. We do have a second source of heat in the rooms and always we can provide with space heaters. Dear Guest, Happy to see you've enjoyed your stay with us! Thank you for your review and please come back ! Thanks for staying with us and for your kind words. Dear Guest, Thank you for staying with us. We are happy you've enjoyed our neighborhood and our lobby and we apologize for the smell in the room. We are looking into fixing the issues you've mentioned and we hope you would give us another chance if travels bring you back to Chicago. George, Happy to see you've enjoyed your stay. We are looking forward to accommodate you again next year. Dear Guest, Thank you for staying with us! Thank you Scott for your recommendation. We hope to accommodate you again in the future. Recreation features at The Majestic Hotel include a fitness center.